One of advantages of living away from home is meeting new people and learning about new cultures. One gets out of their comfort zone and (literally) tastes what the world has to offer. My cousin moved to Bangalore more than a decade ago and as a result has friends from all over India thanks to it being a cosmopolitan city that attracts talent (particularly in Information Technology sector) from all over the country. Now, I’ve told you about her flair with non vegetarian recipes earlier but turns out her friends are super talented too. One such friend who’s from Hubli (in Karnataka) is an exceptional home-cook and a mother of two. Luckily for us, she never hesitates to share her recipes! And thanks to that, my sister recently shared one of her friend’s Chicken recipes with me which she claimed was super tasty and surprisingly easy to prepare. I wasn’t too convinced at first because it sounded too simple, but then I tried it and yes, it definitely is one of the yummiest chicken recipes I have ever had.And yes, it does not require chef like skills and expertise. It is super easy to prepare and is quick too!! Not just that, it looks beautiful and is great for impressing guests at your next dinner party! Let’s get started already now! Place the chicken in a pressure cooker and cover it with water till the level where all the chicken pieces are submerged. 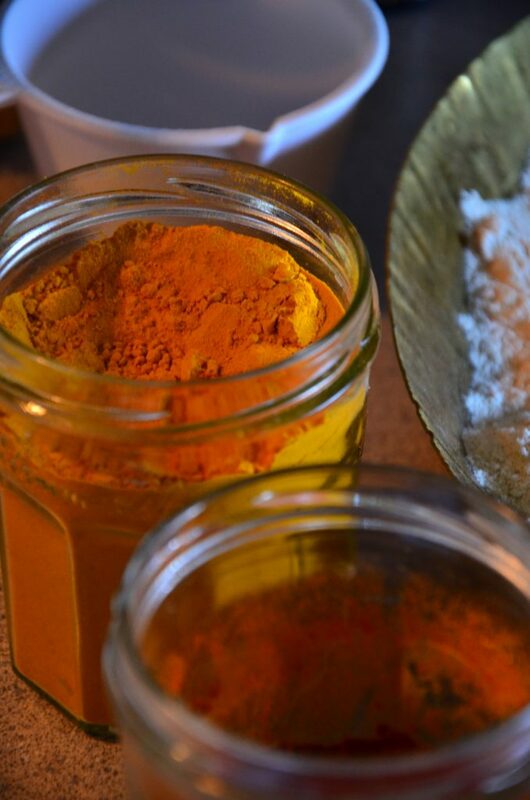 Add turmeric powder, half of the lemon juice and salt. Cover and cook for 3-4 whistles. If you are not using a pressure cooker, cook the chicken for approximately 30 minutes and stop cooking till the chicken is not pink. Meanwhile, clean the coriander bunches and wash it in cold water to remove all dirt and wilted leaves and stems, if any. 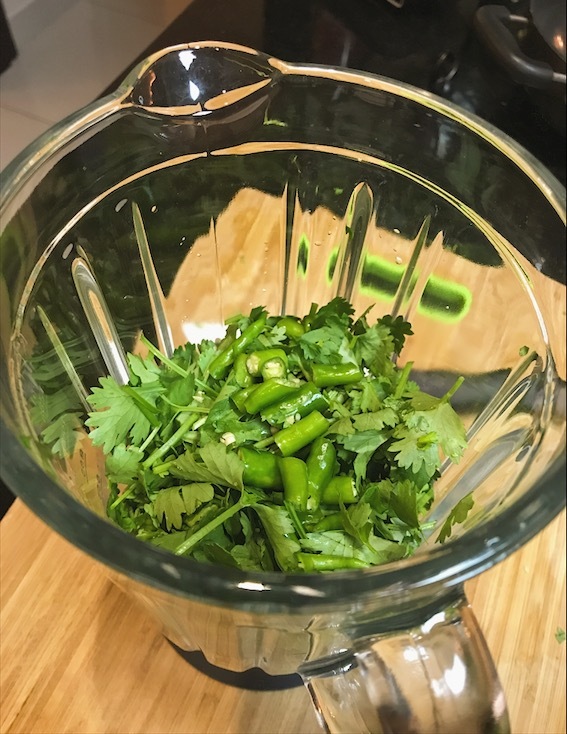 Transfer the cleaned coriander (with the stems) and the green chillies (roughly chopped) and garlic (if using) in a food processor of mixie and process till a smooth paste is formed. You may need to add a couple of tablespoons of water to process this. Once the pressure is released from the pressure cooker, open and take out the chicken pieces. Reserve 1-2 tablespoons of the cooking water from the chicken for use later. Heat the oil in a big kadhai. Add the Coriander-chilli paste. There will be splutters and some sizzling, so be careful! Stir the paste into the oil and cook this for 3-4 minutes on medium low heat. Next, add the boiled chicken and some salt to season. Add the reserved water from the boiled chicken at this stage. 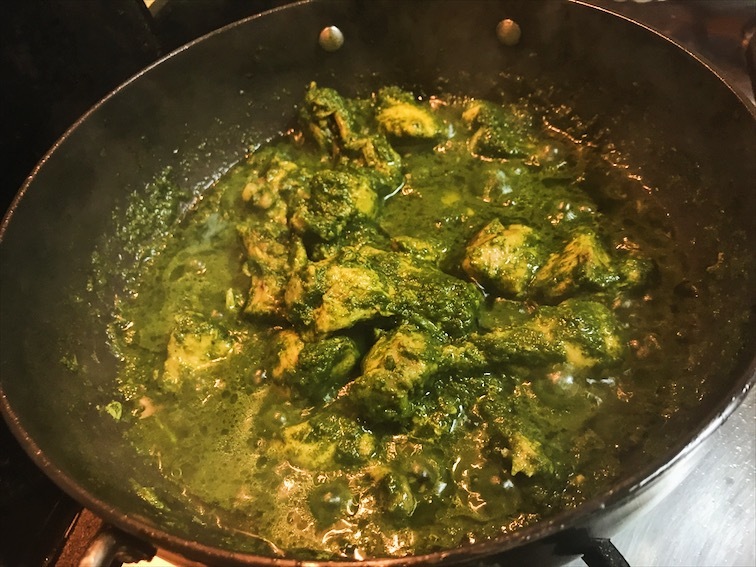 Coat the chicken by stirring in the kadhai and cook for another 7-10 minutes until you see the oil separate on the sides. The oil on the sides should be your indication to remove the chicken from the heat. Add the remainder juice of the lemon on top and mix gently. 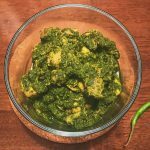 Serve this Coriander Chicken with hot chapatis, parathas or naan! 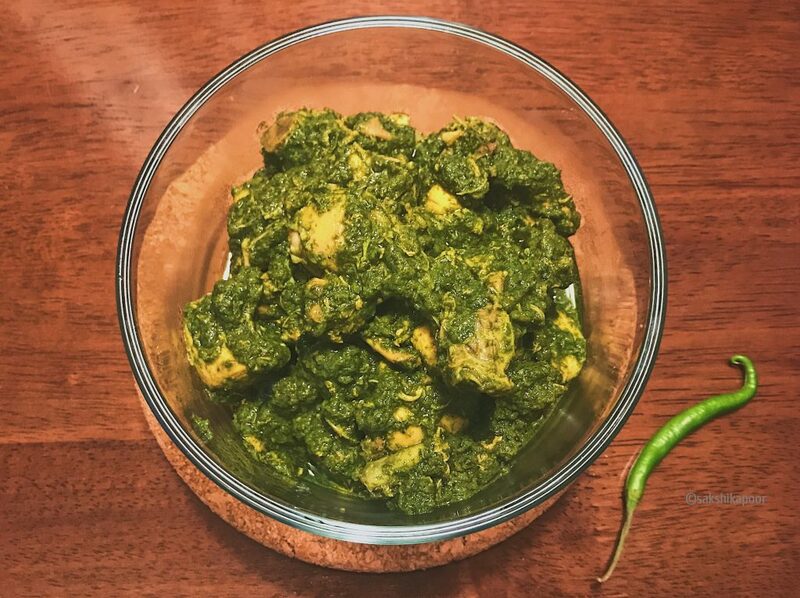 A simple and quick Chicken dish made using Coriander leaves and chillies. Once the pressure is released from the pressure cooker, open and take out the chicken pieces. Reserve 1-2 tablespoons of the cooking water from the chicken for use later. Simple, but full of flavor! I love complicated recipes, with lots of flavor, but also easy recipes that are full of flavor! Thanks Mimi! Do try this recipe and let us know how you found it! I say cilantro, but I understand when people from other regions call it fresh coriander!